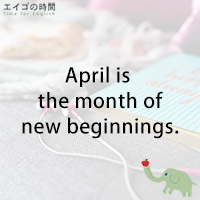 For Japanese, April is the month of new beginnings. Traditionally schools and companies start their new academic or fiscal year in April. Even the government’s fiscal year runs from April 1 to March 31. So, it’s time for a fresh start. For those who made great resolutions back in January, now is the perfect time to see how they’ve been doing with their goals. What about yours? Did you make a new year’s resolution? Do you even remember the goal you set out to accomplish? If you did make one, how is it coming along? If you’re lagging behind, perhaps it’s a good time to get back on track. Personally, I made two resolutions for 2017. One is to spend more time with my mother. I’m doing pretty well on this. The other is to exercise more. To be honest, I could do better. I’m a lazy bum. 1. The Japanese fiscal year begins in January. 2. In Japan, the academic year begins in April. 3. Many people give up on their resolutions by April. Next Post うまくいってる？ – How is it coming along?